Two people have reportedly been shot in Ferguson, as #FreddieGray protests engulf the city following large-scale unrest in Baltimore. 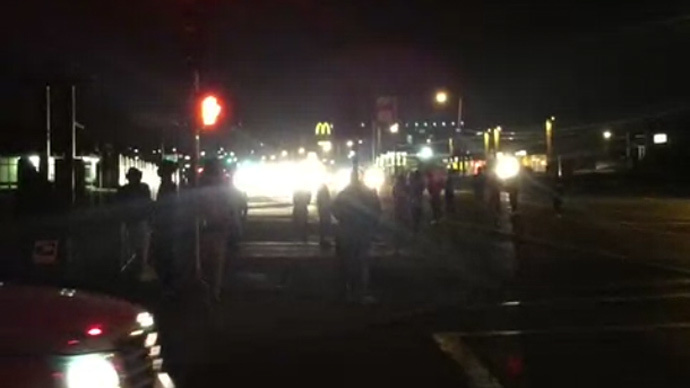 One person was shot in the leg in Ferguson, and the victim’s condition remains unknown. According to local media reports and eyewitness accounts, the man ran to a Chinese takeaway restaurant for help and was subsequently taken away in an ambulance.The gunman has allegedly been apprehended.The shooting happened near where #MichaelBrown was killed. The protests over the death of #FreddieGray started almost a week ago in Baltimore, after 25-year-old African-American Freddie Gray died in hospital of spinal injuries following police detention. On Monday night, demos turned violent, with looting and arson taking place across the city. A state of emergency has been declared in the city, and thousands of National Guard troopers were deployed to step up security. Some 235 people have been detained by police, including 34 juveniles. Twenty officers were injured in the violence. 144 cars and 15 buildings were set on fire, with one person critically injured in one of the blazes. Ferguson, Missouri experienced similar large-scale riots last August after the killing of 18-year-old unarmed black teenager #MichaelBrown by policeman Darren Wilson. Heavy police and National Guard presence was seen in the streets. Officer Wilson was exonerated. Last July, 43-year-old Eric Garner from New York was killed, and the police officer responsible also got off scot-free, following a grand jury decision.